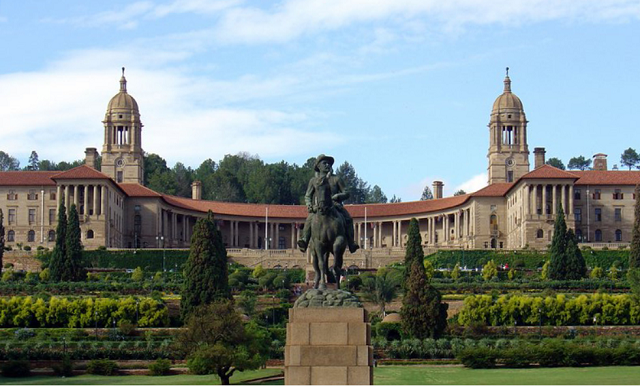 The national debt of South Africa is the money owed by the country’s federal government, which is based in Pretoria. The debts of South Africa’s states and local government are not counted as part of the country’s national debt. The country’s debt has been rising as a proportion of the nation’s GDP for some years. The national debt has become a big political issue in recent years because guarantees on loans taken out by state-owned enterprises are not included in the debt figure and these obligations are rising to become a sizeable amount. Obligations to the Government Employees Pension Fund and also the national pension scheme, which is run by the South African Social Security Agency are also not included. Day-to-day debts of government departments and agencies that are represented by unpaid invoices are also not counted in the calculation of the national debt figure. Who is in charge of South Africa’s national debt? All debt taken out by South Africa’s government is ordered by the Ministry of Finance. The Asset and Liability Management Division of the.Ministry is directly in charge of tracking government debt and issuing debt instruments to raise money. The sale of debt instruments is announced by the Asset and Liability Management Division in a schedule. Only registered brokers are allowed to participate in these actions, which are run online through the government’s Money Market Internet System ((MMIS). Although most of South Africa’s debt is raised through traditional government bonds and Treasury bills, the government does also run a savings bond scheme which is aimed at the general public. These are the RSA Retail Savings Bonds. The different types of savings bonds offered by the South African government are shown in the table below. How does the Asset and Liability Management Division sell government bonds? The maturity period that makes the difference between “short-term” and “long-term” is one year. Treasury bills offer no interest. They are sold at a discount and redeemed at full face value. Inflation-linked bonds also offer the same interest rate every year, but the capital that the interest rate is applied to rises each year, and so they pay out more as time progresses. The total value of benchmark bonds that were current in September 2017 amounted to 1,353,159,048,380 Rand.The total value of inflation-linked bonds outstanding at the same date was 298,078,520,038 Rand. Who holds South Africa’s debt? The major holders of South African bonds, and therefore, the owners of South Africa’s national debt is shown in the table below. You will see each sector’s share of the total stock of benchmark bonds and inflation-linked bonds. From 2017 onwards, the state of South Africa’s national debt has become a hot topic in parliament and in the county at large. By 2018, the issues argued about the national debt started to frighten off international traders. President Jacob Zuma has used debt to fund social programs without having to raise tax. However, this policy has begun to be unsustainable. Although South Africa’s debt to GDP ratio is relatively modest, the government has to offer high interest rates in order to attract traders to its bonds. The result of high interest rates and the government’s expansion of debt means that interest payments rose from R57 billion in 2010 to R162 billion by Q1 2018. This means that the government has to spend 13% of its income on interest payments in 2018. The removal of Zuma in 2018 should have alleviated the concerns of international traders. However, revelations about the government-guaranteed debts of state-owned enterprises caused more panic in the trader community. These guarantees are not counted in the national debt figure, even though they are obligations undertaken by the government and are owed by public-sector companies, such as power utility Eskom and South African Airways. These hidden debts are worrying because “off-budget” debts have been the downfall of many nations, particularly those in emerging economies. Contagion from problems in other emerging economies has also reduced the attractiveness of South African government bonds to international traders. A reduction in the involvement of foreign buyers in the South African government bond market could potentially cause a disaster in the economy. This is because government policy relies on the issuance of more debt in order to prevent high interest payments on current debt from reducing the budget available for social programs. What facts should you know about South Africa's national debt? You could wrap $1 bills around the Earth 823 times with the debt amount. If you lay $1 bills on top of each other they would make a pile 23,077 km, or 14,340 miles high.